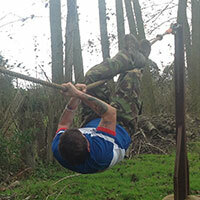 Rookery Fit Farm is a unique fitness assault course offering weekly training for both men and women, designed to get you fitter in a friendly exciting environment. We also offer private hire and corporate days. Rookery Fit Farm’s individual drop-in Sunday sessions are open to individuals aged 16 and over. Sessions run year-round (depending on the weather) and start at 10.00am - please arrive 15 minutes early. Keep an eye on our Facebook page for the latest news and updates. We offer private hire sessions by arrangement, tailored to your requirements. We can cater for any special event, from birthday parties to stag and hen dos, and even outdoor activities for schools. Check our our photo gallery for inspiration. Rookery Fit Farm is available for corporate and team building events, led by our qualified instructors. All abilities, ages and levels of fitness can be accommodated. Booking times are flexible, ranging from shorter sessions to full team-building days. Being an ex Military Marine, a participant of numerous Tough Guy events and many endurance races. I found it hard to find something to match my needs, until I found Rookery Fit Farm, and more importantly Dean Whitfield.